The new iPhone that Apple Inc. is expected to unveil this year is likely to have a larger display than its current models have, with the company ordering bigger screens from its Asian suppliers, people familiar with the matter said. The new screens measure at least 4 inches diagonally, the people said, compared with 3.5 inches on Apple’s latest model, the iPhone 4S. Production is set to begin next month, the people said. Analysts have predicted that the next iPhone will come out in the fall. The people said Apple is working with several screen makers on the new phone, including South Korea’s LG Display Co. & Japan’s Sharp Corp. and Japan Display Inc., which was created last month by three Japanese companies and the government. 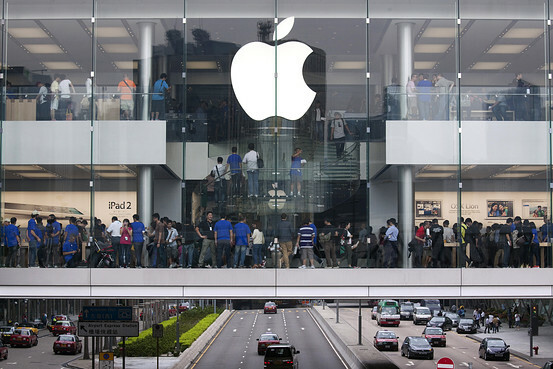 Apple is facing intensified competition from Samsung Electronics Co. The South Korean company, the world’s biggest cellphone maker, recently unveiled a flagship smartphone with a 4.8-inch display, one of the largest smartphone screens available. As Apple prepares for a launch of a new iPhone later this year, people familiar with the situation say the company is planning for a larger screen. Above, the Apple store in Hong Kong. The iPhone has had a 3.5-inch screen since the line made its debut in 2007. Apple also has stuck with one size for its iPad tablet but is testing models with screens smaller than the current 9.7-inch display. Other manufacturers have produced a range of sizes. With the iPhone, Apple effectively defined smartphones as a new category. But the market has evolved rapidly and expanded over the past few years and is crowded with many brands in various sizes and prices. Apple faces particularly fierce competition from Samsung, which sells a broader variety of phones. The two companies together account for more than half of the world’s smartphones. Samsung shipped 44.5 million smartphones to grab 30.6% of the global market in the first quarter, topping Apple’s 24.1%, with 35.1 million iPhones, according to market-research firm Strategy Analytics. Analysts have projected that Samsung’s smartphone shipments will double this year and that the next iPhone will boost Apple’s shipments. Samsung has said that a new version of its Galaxy S III flagship smartphone will hit stores in Europe this month and in the U.S. this summer. The phone’s 4.8-inch screen is larger than the 4.3-inch display on the current model, the Galaxy S II. Taiwan’s HTC Corp also has smartphones with screens that are larger than 4 inches. “The smartphone market has become diverse, but the iPhone still sets the agenda,” said Mizuho Investors Securities analyst Nobuo Kurahashi. The iPhone’s strength lies in the overall experience, including its user interface and applications, and the screen’s size wouldn’t be its defining feature, he said. “If Apple ever released a lower-priced iPhone, that would be more of a sign that the changing market environment is beginning to affect the company,” Mr. Kurahashi said. The iPhone remains a growth engine for Apple and the phone’s popularity in Asia was a factor behind the company’s robust earnings for its most recent quarter. The Cupertino, Calif., company’s profit nearly doubled to $11.62 billion in the quarter through March, while iPhone sales jumped 88%. Aside from their rivalry in smartphone sales, Samsung and Apple have been locked in litigation over designs and patents. The companies also are dependent on each other; Apple is the largest customer for Samsung’s component divisions, which make chips and displays for smartphones and tablets.